It is a real delight to attend the CSSAUK Chinese New Year Gala for the ninth time. The Chinese New Year is celebrated all across the UK -- from No.10 Downing Street to the Palace of Westminster, from the Conservative Party to the Opposition, from big banks to small companies, from Trafalgar Square to Mandarin Oriental Hotel, and from London to Wales. 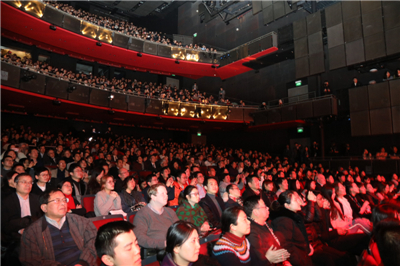 It has become a festival for both the Chinese people and the British people. My British friends often ask me, "Ambassador Liu, where are you going to spend the Chinese New Year holiday? Can you take a few days off?" My answer is always, "For me, the Chinese New Year is the busiest time of year, not a time for rest." Today I missed the first half of your performance as I had to attend the Chinese New Year Reception earlier in the Parliament. I may be busy, I may be late, but I would never miss the CSSAUK Chinese New Year Gala because I value the opportunity to meet and talk with you. I have been looking forward to celebrating the Chinese New Year together with you! and we made the first-ever International Import Expo a great success. Deeper reform, greater openness and vigorous development in China have not only delivered benefits to the 1.4 billion Chinese people. They have also contributed to world peace and prosperity. In 2018, China and the UK made steady progress in forging the "Golden Era". Cooperation across the board has been advanced, and our interests are deeply intertwined. This is particularly true in the field of education. Forty years ago, there were only dozens of Chinese students in Britain. Today, the number of Chinese students has increased to 180,000, up by more than 6,000 times. Over the years, the Chinese students in Britain have carried on the tradition of patriotism and lived up to the expectation of their motherland. They have made extraordinary contribution to China's reform and opening up. Outstanding examples are Wang Daheng and Cheng Kaijia, who are among the 100 awardees of the "medal of reform pioneers". Among the 31 winners of the "national science and technology award", three have studied in the UK. The year 2019 is a "big year" for China. We will celebrate the 70th anniversary of the founding of the People's Republic. Today is the 23rd day of the twelfth month of Chinese lunar calendar. It is known as "Xiao Nian" or the "Small Spring Festival". So, as we look ahead to the "big year" on this day literally translated as the "small year", we must all find a place for our small self in the big picture. I would like to share with you my three hopes. First, I hope you will align the "small goals" of yourselves with the "big goals" of the country. Patriotism is at the heart of the Chinese nation. In the past 70 years since the founding of New China, it is in the spirit of patriotism that the Chinese people won independence, became prosperous and strong, and embarked on a new journey of building a modern socialist country in all respects. President Xi Jinping said, "Only by aligning the small dream of yourselves with the big mission of the whole nation will you become inclusive as the ocean and stand tall as the mountain." I hope that you will align the small goal for personal progress with the big goal for national rejuvenation. I hope you will aim high and work hard. I hope with what you have learnt now, you could serve your motherland in the future. Second, I hope you will use your "small stories" to serve the "big diplomacy". Studying in Britain enables you to learn from others and improve yourself. I do hope you will cherish this opportunity. And I also hope you will reach out to your foreign friends and become an envoy of friendship between China and other countries. You could share your personal experience with your foreign friends. You could tell them China's stories and help them gain a better understanding of China. This is important for enhancing the friendship between China and the West, including the UK. Third, I hope you will build your "small institution" into a "big platform". 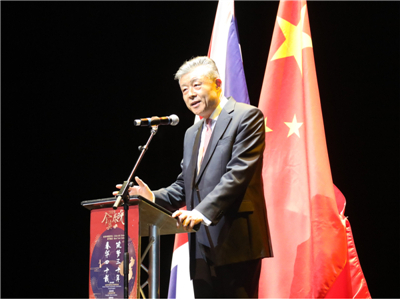 In the past more than 30 years, CSSAUK has done a great deal for Chinese students in Britain. Your contribution has been fully recognised and supported. In the new year, I will count on you to continue to be patriotic, democratic and down-to-earth in the operations of this Association. You are in the position to play a bigger role in championing the rights and interests of Chinese students and scholars here in the UK. I hope the CSSAUK will grow to become a big platform for exchanges and a standard bearer for overseas Chinese students associations around the world. You are far away from your home and your loved ones. Here in the UK, the Chinese Embassy is your home. We have your back. In the new year, we will continue to do a better job to provide you with better services in a more efficient manner. In conclusion, I wish you and your family a healthy, happy and prosperous Year of the Pig!